A city in the darkness of the caves? A city whose dominant colour is purple? For when you just can't build high enough. Also, I wonder if this ozo? o2o? will come into the mix. 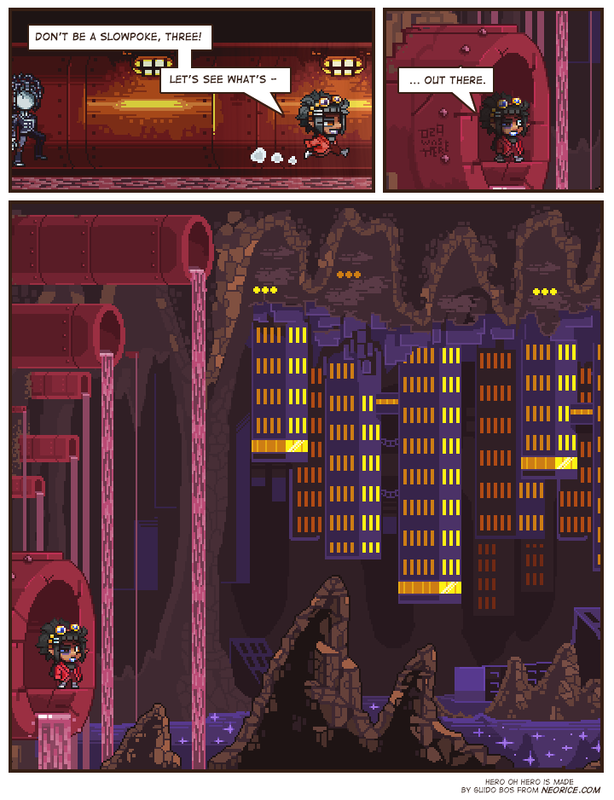 I just finished binging through the whole comic, and I have to say that this is the most impressive pixel comic I've ever read. Definitely in my top 10, thanks for making it! Short note on the background: Because of the lighting on the buildings and the background layer it looks closer than it should be based on the perspective with Toby. The buildings look closer than the drain that is supposed to be on their level of the background. The buildings look closer and too small (because they look closer). I'm not an art person but it just looked slightly odd to me, I hope that made some sense. It's time for some batmanning.